: Maninarakorn Hotel Chiang Mai. Our convention rooms are located on the top floor of our lovely hotel. They offer stunning roof top views of the surrounding city and mountains. 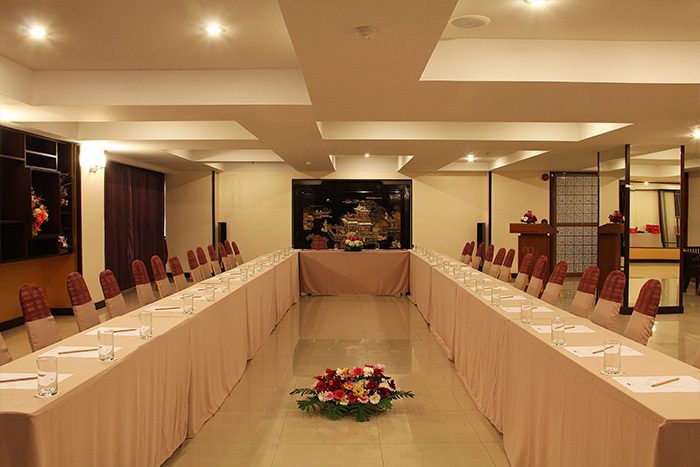 Our flexible well-equipped conference rooms are divided into two separate sections. Accommodating up to 300 guests from reception, weddings, cocktail partio to other important functions. The meeting rooms located on the 3rd floor. It’s purpose is to cater for small private parties, meetings and presentations with accommodation up to 50 people. The rooms may also be divided into 4 separate rooms. 99 Sridonchai Rd. T. Changklan, A. Muang Chiang Mai 50100 Thailand. 99 Sridonchai Rd., T.Changklan A.Muang Chiang Mai 50100,Thailand.